Today marks the twentieth anniversary of Nelson Mandela's release from Robben Island prison, offshore from the South African mainland. Mandela was incarcerated for twenty seven years in a small cell. During that time he could have moved into the depths of bitterness and hatred. Instead he emerged to lead his nation toward integration. 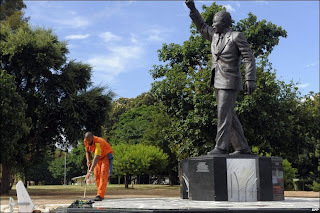 The statue above depicts Mandela's triumphant emergence from prison. Sadly, Mandela, at age ninety one was not well enough to return to the prison today. Some argue that the South Africa of today is a grim example of failed hope and expectations. There is still such a long way to go and lawlessness is a threat to civil society. Yet the Peace and Reconciliation Commission led by former archbishop Desmond Tutu and Mandela's choice to move toward reconciliation in his leadership style probably kept the country from anarchy. In the film Invictus the South African rugby team went to Robben Island where the captain, Francois Pienaar, found inspiration for perseverence as he stood in Mandela's cell. Of course we have stories of our New Testament heroes including the apostle Paul and John the Baptist and even Jesus (briefly) who spent lonely hours and days in prison. Ultimately they came to represent the freedom which overcomes dark empires. Are you inspired by Mandela's story? Will those of you who have children remind them about this? I hadn't realized that today marked the anniversary. Now comes the part where I figure out how to couch this in terms two five year olds can understand ... ! The ministry of your blog is that it makes us stop and think about things that busy lives speed past all but unnoticed. Like Ian, I didn't know today's significance, until I glanced at the headlines in today's paper. I will slow down and read the article, and as you suggested bring it up with my older daughters. I am never quite sure what they take from such conversations but I shouldn't miss the opportunity to open a door to understanding. My memory for world events is general at best but I do enjoy re-learning (googling) the details as the kids inquire (and I do wonder how our parents managed without the internet). You would think that being alert and aware of the world around us would be relatively simple in this day. There are so many important priorities in our lives that this can be more of a challenge than we might imagine. Both of you raise the important question of when we begin introducing younger children to important issues without confusing or traumatizing them. So your twins may need to wait, Ian, and you are being selective about what you offer to your six-year-old Laura. Makes sense. Thanks.